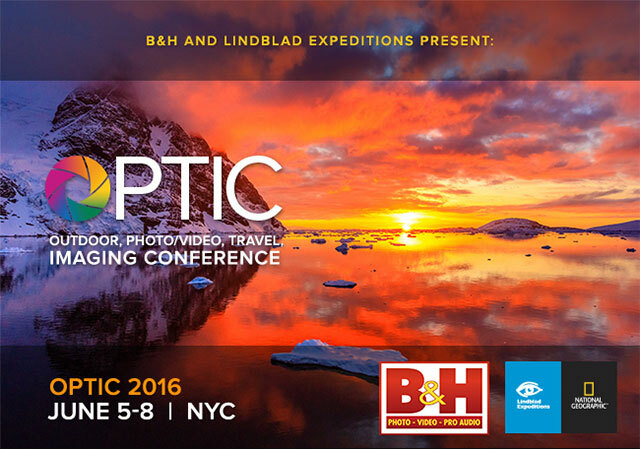 OPTIC 2016 is four days of presentations, events, live demonstrations, portfolio reviews, gallery exhibitions, cocktail parties, sunset cruises and a Central Park photo expedition along with a giant two day long trade show. Please see each day for a complete schedule of the many activities that OPTIC offers that you can choose from, to customize your experience. The main stage on day one and day two will be live streamed. All lectures will be available to view at a later time, so you can relive OPTIC and not miss a single exciting presentation! Can’t attend this Event Live in New York? Watch it LIVE ONLINE! 10:00 AM EDT Ralph Lee Hopkins presents: Wildlife Photography: The Decisive Moment Matters Most! Directions: Dana Center is located just inside Central Park, at 110th Street between Fifth and Lenox Avenues. Use 2 or 3 trains and exit at Central Park North 110th Street. C train to Cathedral Parkway 110th Street. Sony Central Park Nature Photo Walk with Lindblad Expeditions: Explore the north end of Central Park. We have prepared a great photo walk, with a map with spots along the route where top pro photographers will be stationed to give you tips. Visit key locations in Northern Central Park that offer outstanding photo opportunities and learn about the unique wildlife and history of the park. Select locations will have Central Park guides from the Central Park Conservatory, Sony Artisans Andy Katz, Katrin Eismann and Brian Smith and National Geographic Photographers from Lindblad Expeditions (providing the experience of a Lindblad Expedition field trip) to help you both learn and get great images. A map of the locations will be provided so you can navigate the park and photo stations at your own speed. The starting point for the Sony Central Park Nature and Photo Walk will be the Dana Center. Perched on the northern shore of the Harlem Meer, the Dana Center is Central Park’s newest building, and the first to be built specifically as a visitor center. The Dana Center will have the Sony concierge tent with light refreshments and access to bathrooms. Sony loaner equipment will also be made available. Brian, I’ve watch most of day one, and I must say your presentation was by far the easiest to follow and the most interesting. My wife watched a few minutes of your presentation, the part on Haiti, and her comment was you were an interesting speaker.